Seals are known entertainers and Stefano, the fun-loving Italian seal, does not disappoint. Stefano is known to all as the eternal optimist – the one who manages to look at the brighter side of everything. However, even Stefano looks lackluster with the color gone from his life. 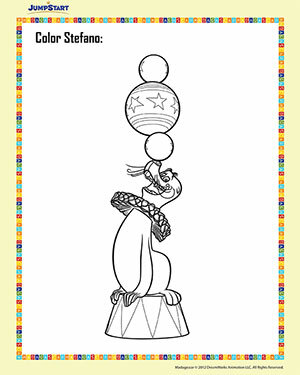 Rescue him from this problem and use the most bright and beautiful colors for this free and printable Madagascar worksheet. Also, check out our Color Stefano page.